Indium Corporation gold-based solder alloys provide reliable joint strength and superior thermal conductivity, especially as compared to the standard SnPb or SAC solders. These alloys are well-suited for applications that require high reliability and high temperature, as well as a need for Pb-free. Gold-based alloys offer a variety of advantages that offset the cost of gold, including superior thermal fatigue resistance and resistance to corrosion. In addition to its excellent wetting properties, AuSn exhibits one of the highest tensile strength measurements in the soldering world, and its shear strength provides a great alternative to brazing alloys when high strength is required at soldering temperatures. AuSn also provides an excellent seal, which works well in lid applications. Indium Corporation's casting process provides a cleaner alloy by minimizing impurities and oxides. Gold-based alloys are made to purities of either 99.9 or 99.99% with a standard tolerance of +/- 0.5% on gold content. 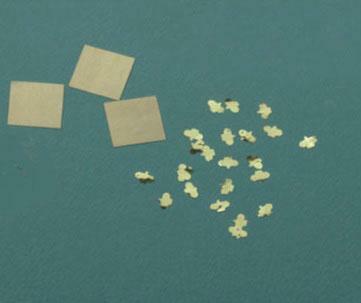 Gold-based solder alloys are used for medical products, as well as for aerospace, defense, package sealing, optics, and specialty MEMS packaging. Gold-based alloys can be processed in a variety of soldering applications, including vacuum solder, die-attach, reflow, laser soldering, vapor phase reflow, and manual soldering. Indium Corporation offers gold-based alloys in a variety of forms, including solder paste, solder preforms, solder wire, and solder spheres. Indium Corporation will be exhibiting at IMAPS 45th Annual International Symposium on Microelectronics in San Diego, California, September 9-13, 2012 at booth #329. For more information about gold-based alloys, visit http://www.indium.com/gold or email gold@indium.com.